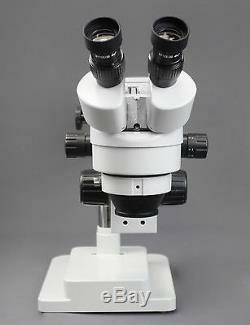 Parco Scientific PA-5EZ-IFR07 Binocular Zoom Stereo Microscope. 45° inclined binocular head that rotates 360°. It features a 54-76mm interpupillary adjustment, while both ocular tubes are equipped with a (+/-6) diopter adjustable, to compensate for eye-strength difference when needed. 7x45x standard magnification range, that when used with the included 0.5x & 2x auxiliary lens, expands to a 3.5x90x magnification range. It has a field of view of 2 ½ (65mm), while the parfocaled optical design ensures that images remain sharp, crisp, and focused, throughout the entire magnification range. Large-and-stable double arm boom stand offers a long and flexible working distance, while the advanced ball-bearing technology allows the arm to glide with little resistance. The solid-steel, table-top, rectangular base provides a solid foundation to fit your observational needs. Precise, heavy-duty rack and pinion focusing mechanism, with large knobs and adjustable tension control. Robust and versatile, it is the perfect microscope for laboratory and industrial application, and is designed to provide outstanding value without compromising performance. 144-LED ring light with intensity control, guarantees a clear-and-crisp, cool-to-touch white light that lasts up to 60x longer than traditional tungsten bulbs. 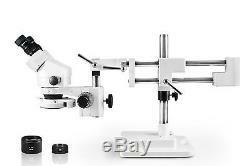 This Parco Scientific binocular zoom stereo microscope is ideal for laboratory and industrial applications. Using its high resolution, great depth, and a large field of view, it is the perfect instrument for viewing any three-dimensional specimen or large objects. The solid cross block and brass inserts improve movement, while the friction collar secures the peg and allows the microscope to rotate around a vertical axis. Its rotating, swivelling, and tilting functionalities allow for it to cover wide, horizontal and vertical viewing areas; making it sure to meet your flexibility requirements. Packed in a fitted Styrofoam box, and includes a dust cover and an instruction manual. Head: Binocular, 45° inclined, rotates 360°. Magnification Range: 7x45x, 5x90x with the 0.5x & 2x auxiliary Lens. Working Distance: 100 mm standard, optical working distance can be increase or decrease 30-165 mm with auxiliary lens. Focusing: Heavy duty rack and pinion focusing arm with tension adjustment. Stand: Double arm ball-bearing boom stand. Light Source: 144-LED ring light with intensity control. 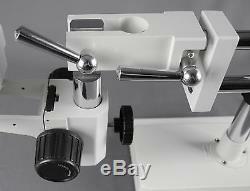 Binocular zoom stereo microscope head. Pair of 10x WF eyepieces. 5x and 2x auxiliary lens. 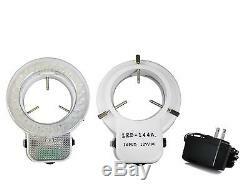 144-LED ring light with intensity control. 24 x 20 x 12 / Weight: 48 lbs. Parco Scientific is a leading supplier of scientific products throughout North America. Owned and operated by veterans in the scientific equipment industry who value quality, it has served the educational, medical and industrial sectors for over 30 years. Our technicians have years of first-hand experience and have extensive knowledge on the equipment we sell. We provide maintenance and repair parts from our stock on-hand. We truly believe here at Parco Scientific, that our company and our products are unique from any other merchandising providers. They ensure that the mechanical movement, electrical safety and optical alignment are in perfect order, with no dust in the optical system. Our superior quality is supported by their experience and our inventory of microscope parts on-hand. After 1 year, authorization will be determined on an individual basis. You MUST have a Return Authorization Number in order to return any item. Your item must be in NEW and RE-SALEABLE condition in order to be accepted for return. Please do not discard packaging or contents, as couriers often want to inspect the damaged merchandise and packaging to assist in the claims process. You may be asked to complete our Return Authorization form and to provide photographic evidence prior to receiving a Return Authorization Number. The item "Parco Scientific PA-5EZ-IFR07 Binocular Zoom Stereo Microscope" is in sale since Tuesday, August 22, 2017. This item is in the category "Business & Industrial\Healthcare, Lab & Life Science\Lab Equipment\Microscopes". The seller is "parcoscientific" and is located in Plymouth, Michigan. This item can be shipped to United States, Canada, United Kingdom, Denmark, Romania, Slovakia, Bulgaria, Czech republic, Finland, Hungary, Latvia, Lithuania, Malta, Estonia, Australia, Greece, Portugal, Cyprus, Slovenia, Japan, China, Sweden, South Korea, Indonesia, Taiwan, South africa, Thailand, Belgium, France, Hong Kong, Ireland, Netherlands, Poland, Spain, Italy, Germany, Austria, Israel, New Zealand, Philippines, Singapore, Switzerland, Norway, Saudi arabia, Ukraine, United arab emirates, Qatar, Kuwait, Bahrain, Croatia, Malaysia, Chile, Colombia, Costa rica, Panama, Trinidad and tobago, Guatemala, Honduras, Jamaica.